Life is made of membranes. At the very lowest levels, our cells use fatty membranes to separate inside and outside, creating sanctuaries for life from the chaos of the world. We wear thin, makeshift, wearable membranes of different colours and designs to protect us wherever we go. Our cities are defined by membranes too: thicker, more solid membranes that shield us from the outside, that create a space of security and warmth, and that draw lines and divide space to include and exclude, and segregate and bring together. Walls are the membranes of cities. 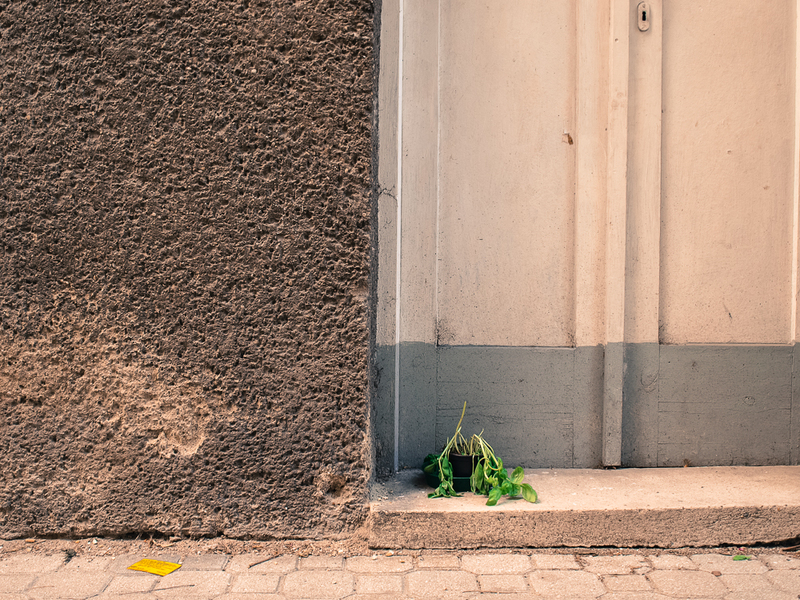 Photography can be an act of remembrance, an aid to recall some fleeting visual memory. Walls allow just that: to stare blankly back while saying whatever you want them to say, to be both foreground and background, canvas and paint. I've seen a fair number of walls over the years, and this page documents some of the more interesting ones. Did you ever see history portrayed as an old man with a wise brow and pulse-less heart, weighing all things in the balance of reason? Is not rather the genius of history like an eternal, imploring maiden, full of fire, with a burning heart and flaming soul, humanly warm and humanly beautiful? Therefore, if you have the capacity to suffer or rejoice with the generation that had been; to hate with them, to love with them, to be transported to admire, to despise, to curse as they have done - in a word: to live among them with your whole heart and not alone with your cold, reflecting judgement: then follow me. I will lead you down into the well. My hand is weak and my sketch humble, but your heart will guide you better than I. The Ishtar Gate, one of the seven wonders of the ancient world, constructed on the orders of King Nebuchadnezzar II in 575 BCE. 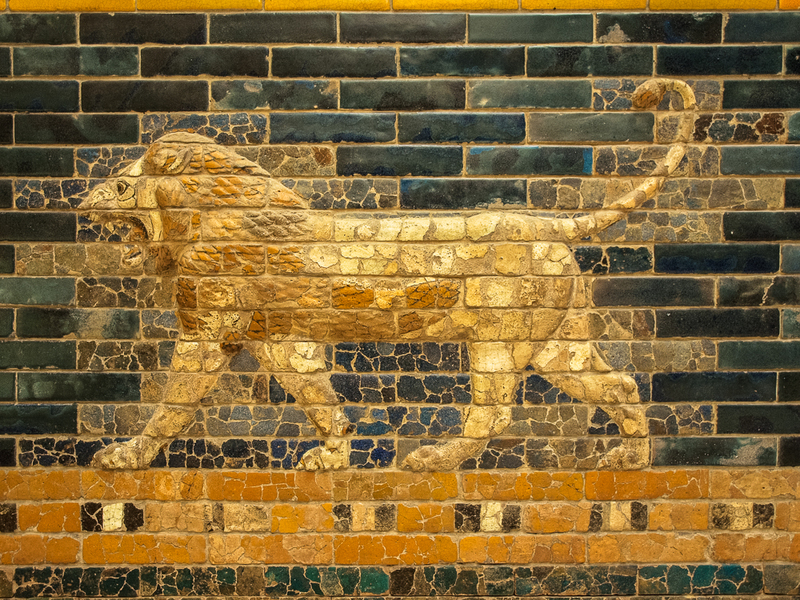 Dedicated to the Babylonian goddess Ishtar, it was constructed using glazed brick with alternating rows of bas-relief mušḫuššu (dragons) and aurochs (ancient bulls), symbolizing the gods Marduk and Adad respectively. It's now exhibited in the Pergamon Museum, Berlin. 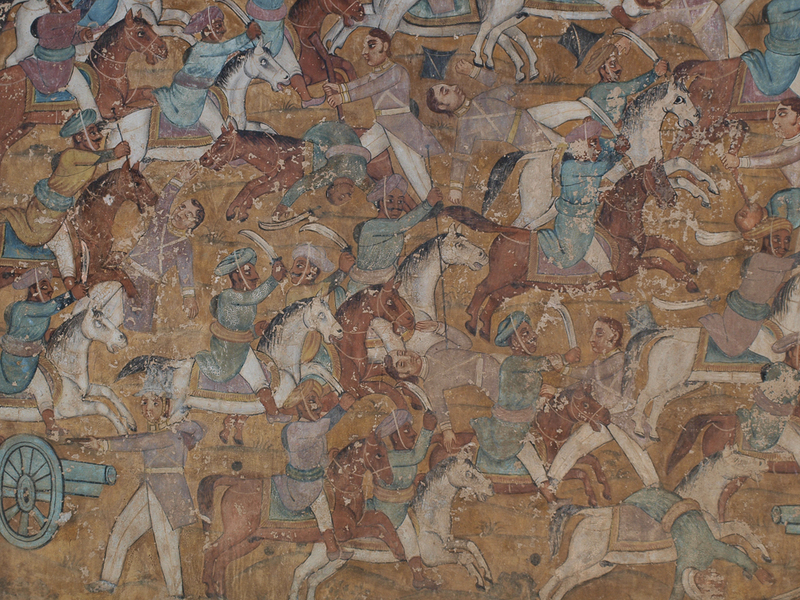 Mural on wall of Tipu Sultan's palace, showing a glorious battle where he kills all the evil British. Notice the white soldiers in various degrees of discomfort. However, things didn't work out so well for Tipu Sultan. After the Fourth Mysore War, Tipu Sultan was killed by the British in 1799, and his once formidable fortress of Srirangapatna is now slowly being taken over by tenacious ficus. The stone fortress of Chitradurga. Local legend has it that a man-eating giant named Hidimbasura was killed by Bhima here, and the massive granite boulders that dot the landscape were part of the arsenal used during that duel. 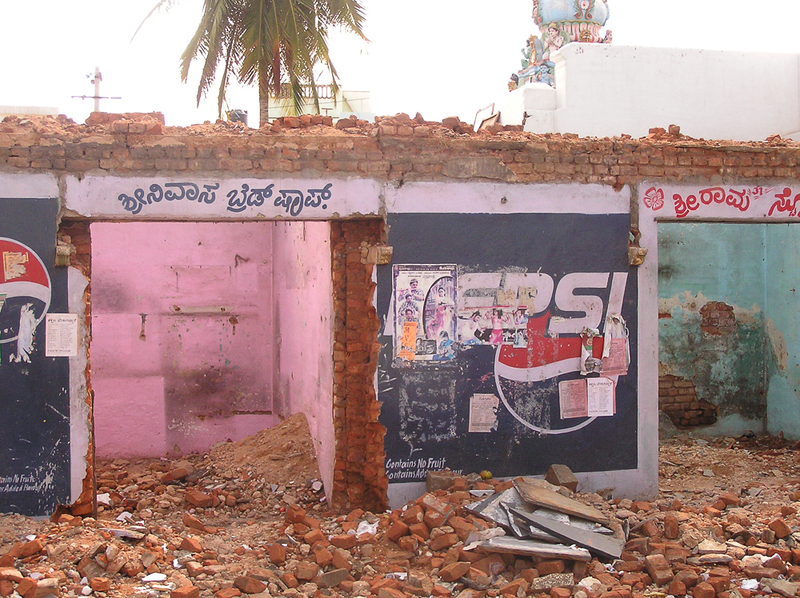 With the death of Tipu Sultan, Chitradurga fell under British control, its massive walls never seeing action against the British. The Hazara Rama Temple Complex, Hampi. Once the capital of the mighty yet ironically named Vijayanagara (city of victory) Empire, it was besieged by the Deccan Muslim confederacy, and destroyed in 1565. All that remains are broken stones and empty roads. Round the decay of that colossal wreck, boundless and bare, the lone and level sands stretch far away. Panorama of carvings on the ruins of the Hazara Rama Temple, Hampi. 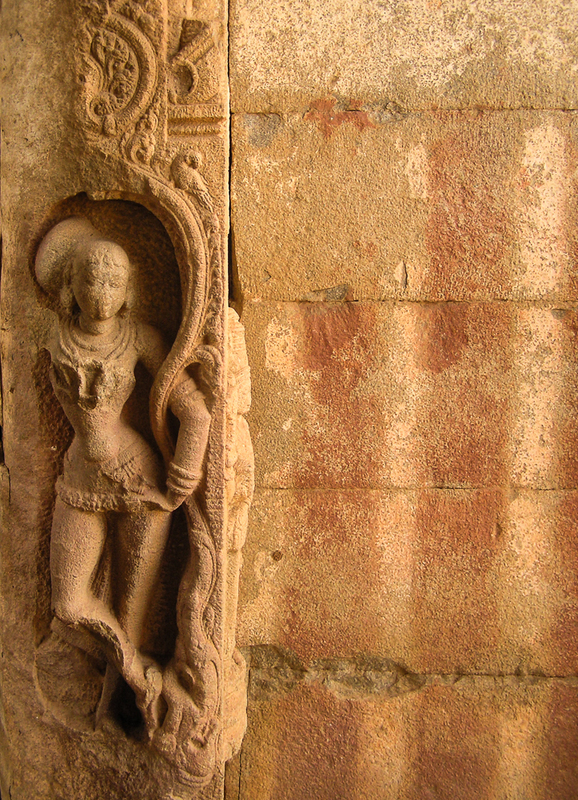 A pillaged statue guards what once used to be the entranceway of the Vittala temple. You can still see the red and white vertical stripes that temples are painted with. The breasts of this statue, considered especially obscene by the Muslim invaders, have been cut off. Yet life goes on. Despite the entire town being considered a UNESCO world heritage site, and despite literally every rock hiding an archealogical treasure, people continue to live and work here. 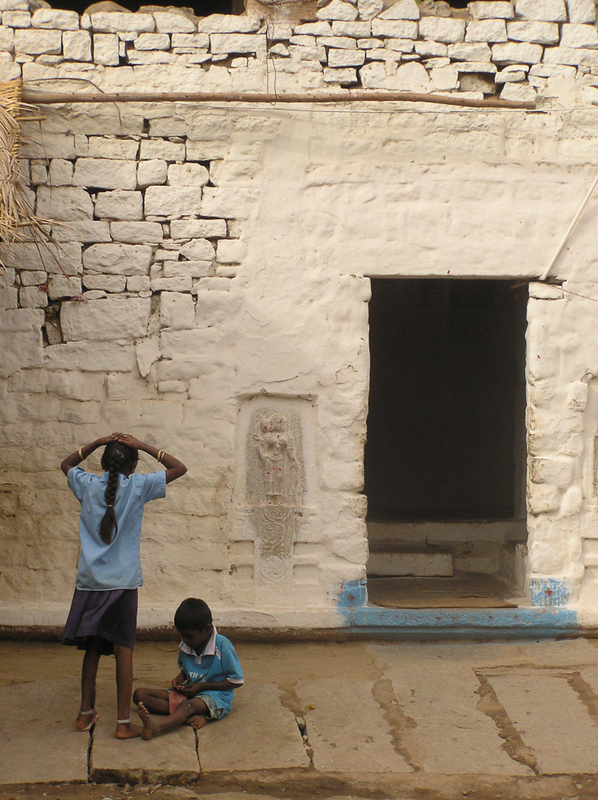 Kids go to school, and they come back to their thousand-year house, which they consider entirely unremarkable. A few hundred kilometres away is the ancient temple complex of Halebidu (which literally means "old city"), the 12th century capital of the Hoysala Empire. 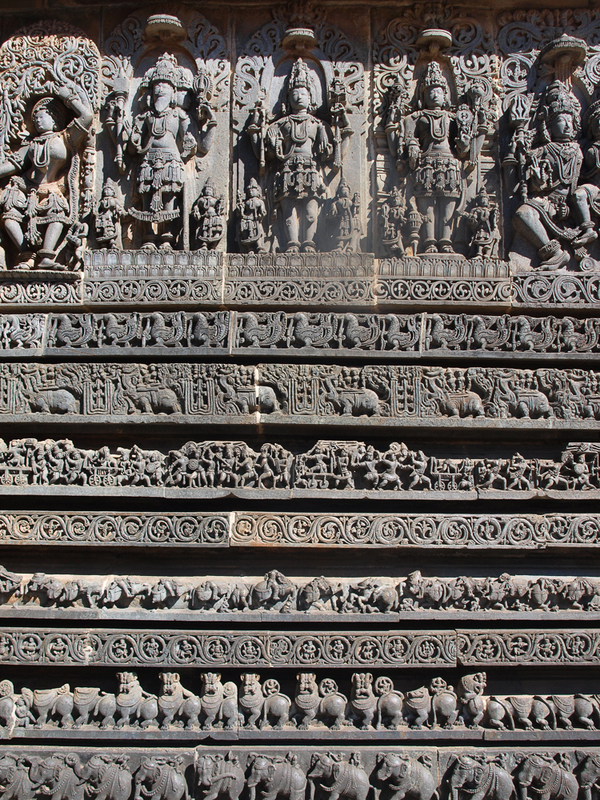 The walls on this temple are covered in these intricate carvings. A wall makes a tempting canvas: large, flat, and strategically located. Sometimes the architect recongises the potential of the wall to be an expressive medium, and not just a vertical flat structure that seperates inside from outside. 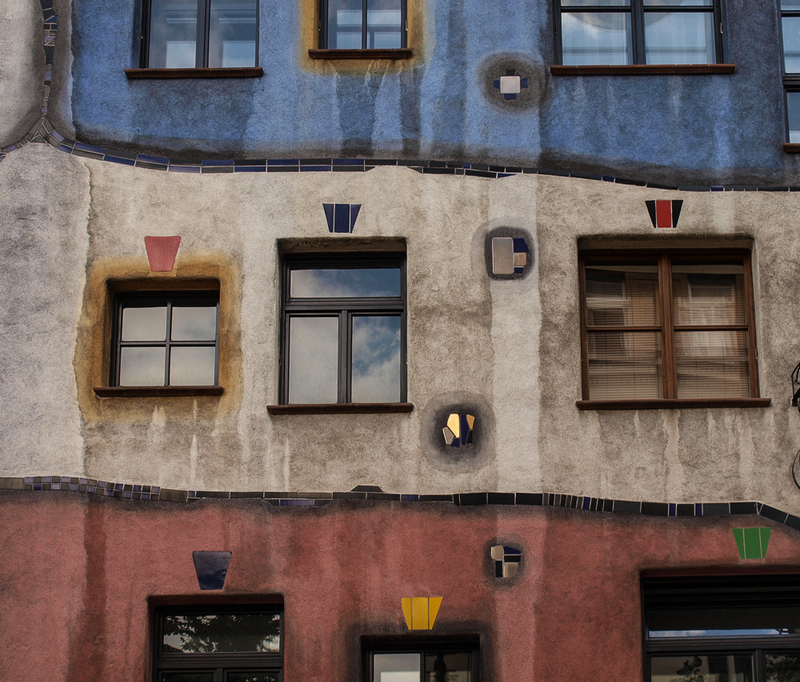 One such example is the Hundertwasser Haus in Vienna, where the wall becomes a living expression of the philosophy of the architect. In other cases, a colourful mural makes you forget about the wall behind it. 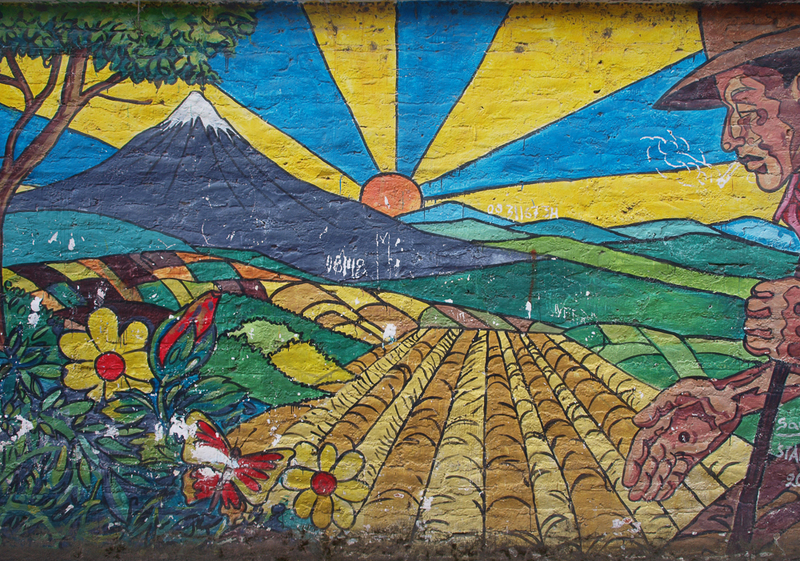 This wall shows you all the elements of life under the shadow of Tungurahua; life giver and destroyer of worlds. It's an active volcano, meaning that living under it is fraught with peril, but the ash and lava from the volcano makes the surrounding land incredibly fertile. The university town of Göttingen, Germany is home to many peculiarities: they have a statue of a goose-girl who gets snogged by fresh graduates of the University, and in the good old days (when Otto von Bismark, the future first Chancellor of Germany "studied" Law there), the University ran its own prison, where it jailed students for heinous crimes such as extreme drunkenness and cycling while extremely drunk. 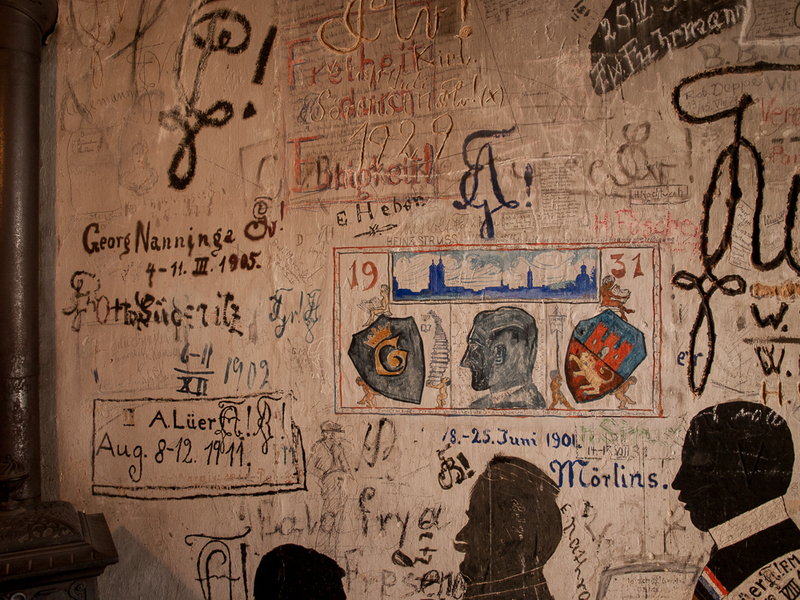 Students had a blast while imprisoned, and commemorated their stay there with silhouettes and graffiti on the walls. Imprisonment rapidly became a rite of passage for the cognoscenti. Sadly, the University no longer operates a prison, and cycling while extremely drunk is dealt with a stern warning by local police who urge you to be more careful. 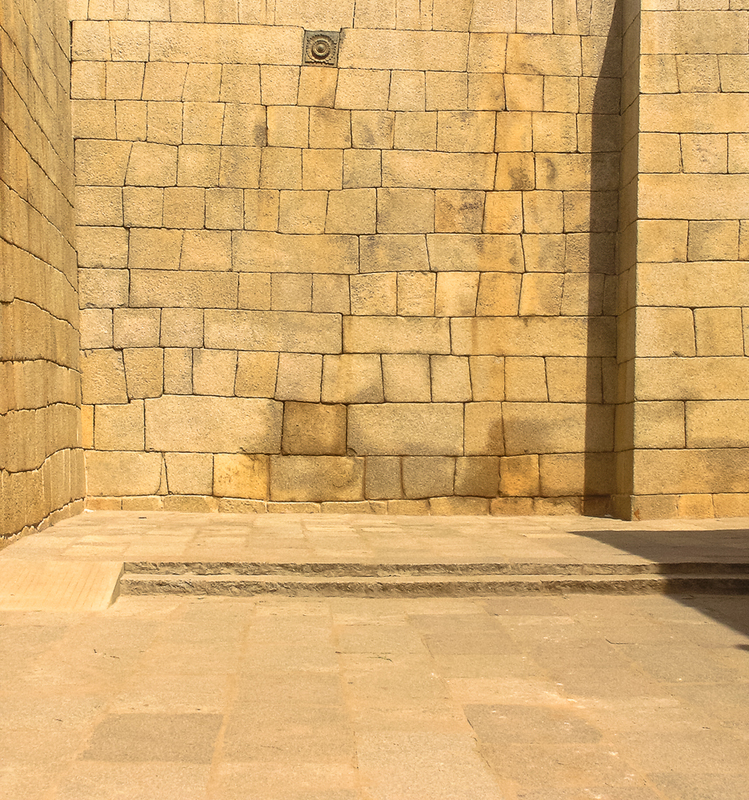 Granite walls in Bangalore, India are very common: it sits on the Deccan Plateau, a massive granite formation, and is home to a number of governmental institutions, that tend to surround themselves in walls that are built according to Soviet design principles. 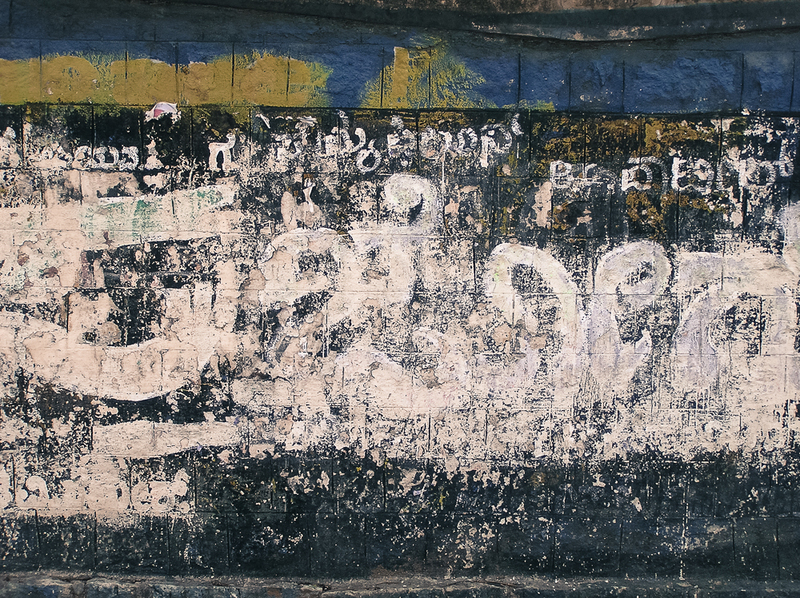 The massive gray surface makes an attractive hoarding to push your new movie – till someone else whitewashes over your effort; which in turn wipes the slate clean, leading to a fresh cycle. Sometimes all you need to make a bold statement is to stick to a vivid color and go all in. 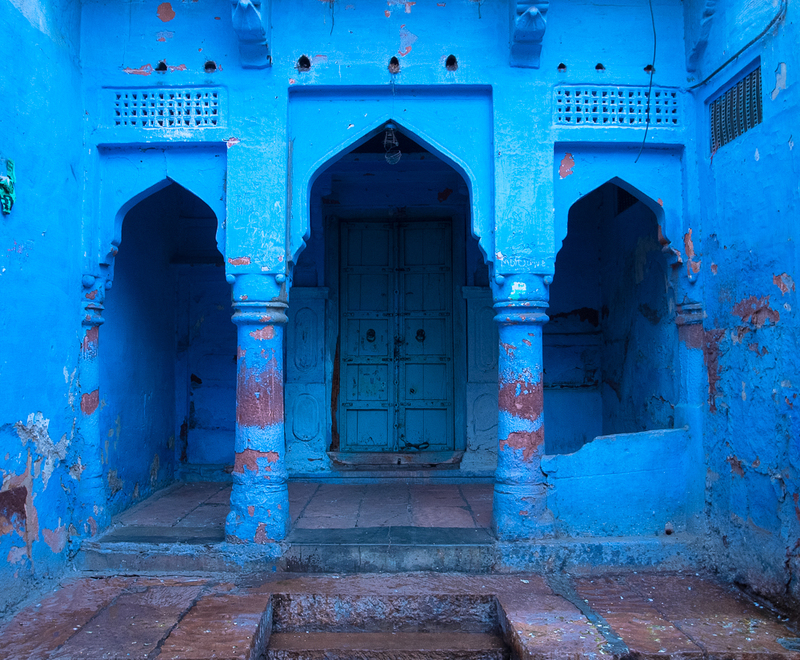 These blue walls mark a house out in Jaisalmer, Rajasthan, India. 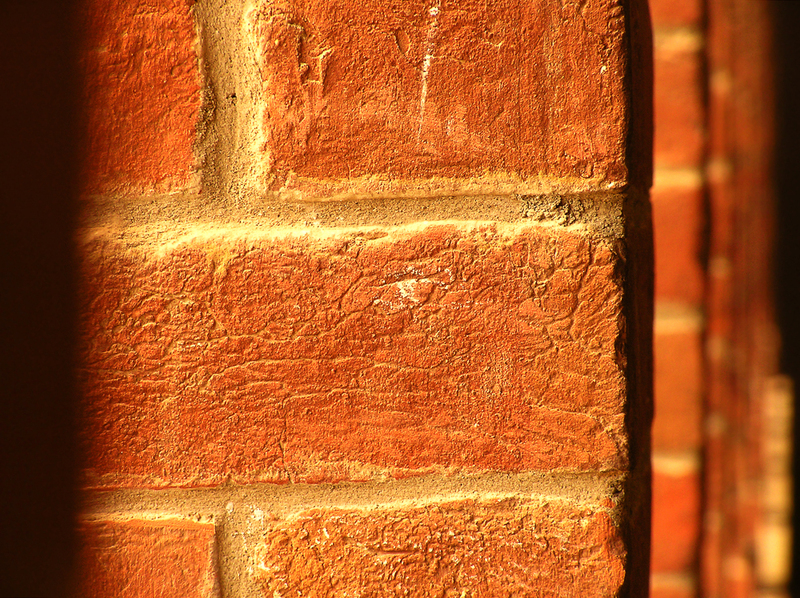 Walls can be a window into the identity of a place; or a certain time. The way they are and the way they look can tell you stories of the people who live there, and what they want, and where they want to be. It's all there: if you know what to look for. 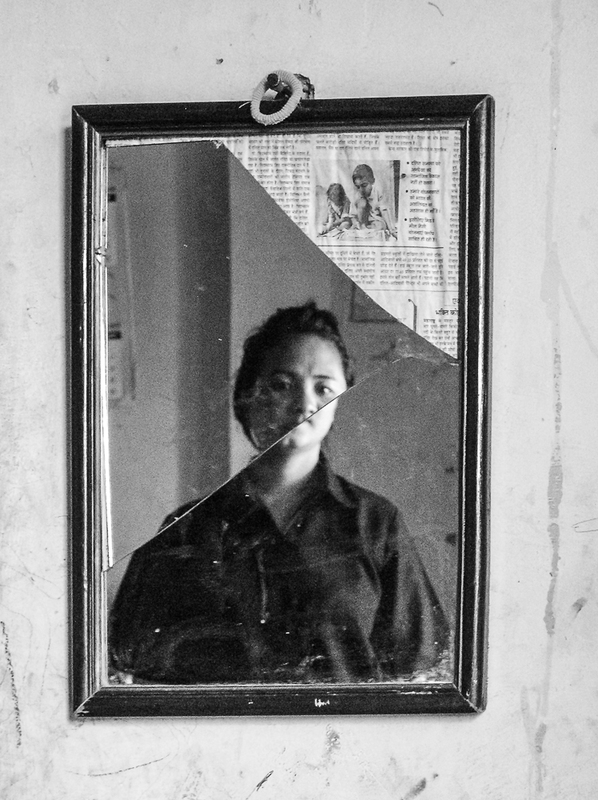 In a small gray house in a small gray part of the large gray city that is Delhi, a broken mirror frames a refugee from Burma in her house. She has no hopes of going back, and is busy making a new life for herself in Delhi. 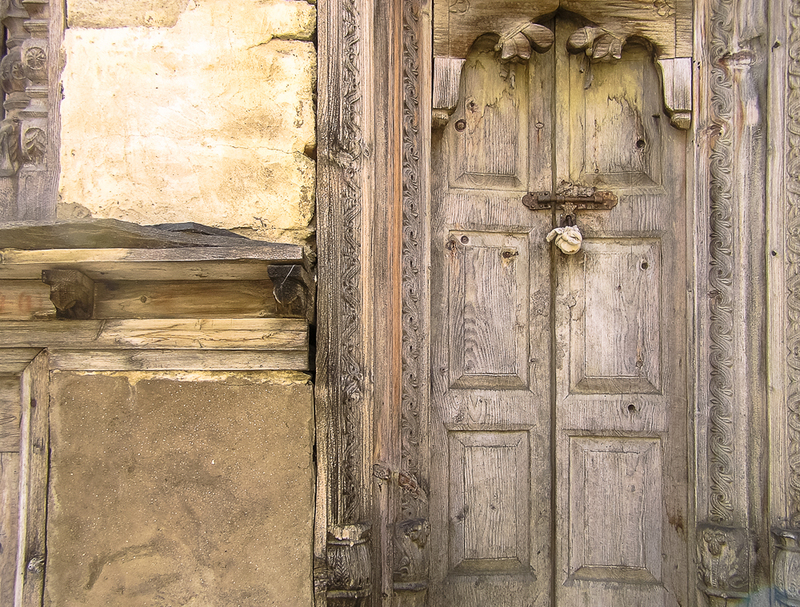 A locked door to a house in a nameless village in the lower Himalayas. The farmers and shepherds who live in this valley only live here in the summer, and go down to the plains in the summer. The lock is wrapped in cloth to prevent damage during the winter months. 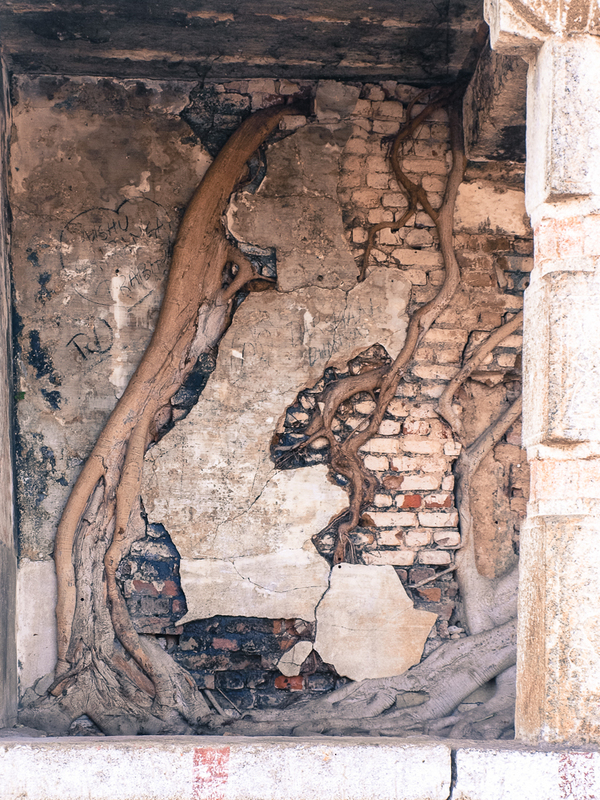 An unfinished brick wall in Murano, near Venice, Italy. 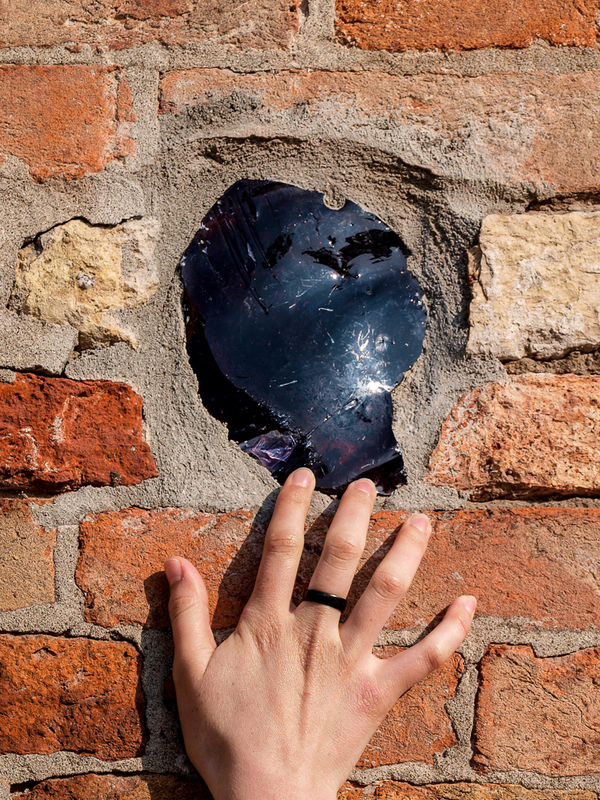 A globe of black glass is embedded in the wall, perhaps an superfluous piece from the glass makers'. Following the fall of the Soviet Union, India implemented a series of changes in economic policy. Partly due to that was a craze in all things Americana — like video game arcades that handed out plastic Disney characters that children in that era craved beyond all things. 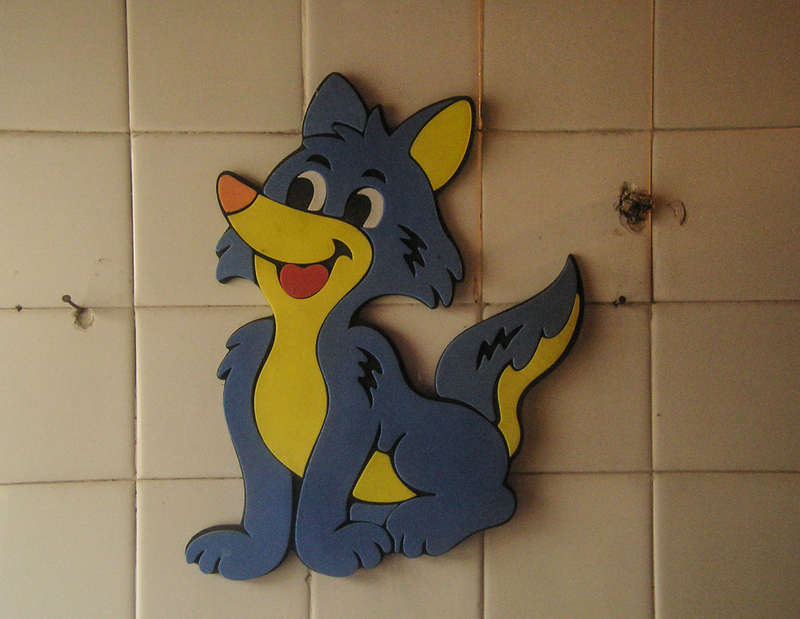 Here is one hanging on a bathroom in an apartment in Delhi. Graduates of St. Stephen's College, Delhi, India, all know that there is something about the building that goes a long way in defining its character. The current building was designed by Walter Sykes George in the last years of the British regime, and the red brick of the building shown in the photograph below is instantly recognisable to anyone who has seen the building. It reminds us of our College days, but are there other memories buried deep in those red bricks? 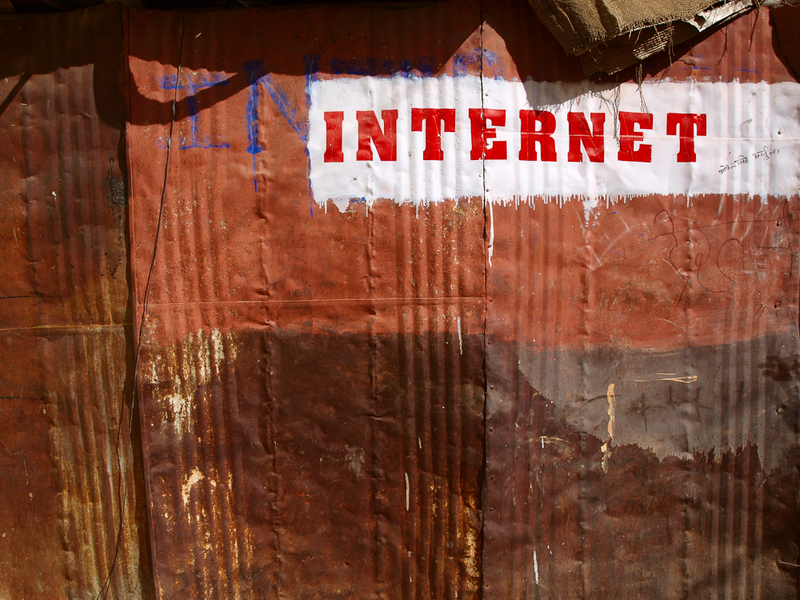 Is it the red of hotheaded revolutionaries who were moulded here in the '60s and the '70s, who went on to wage protracted People's war, whose slogans are still scribbled on its walls? Does anyone remember where Mohandas Gandhi stayed when he visited the College shortly before Independence? Which corridor did Tagore walk down composing the Geetanjali? Or is the red an altogether older red: the red of the thousands of civilians massacred by the British in 1857 on the very land that College now stands on? Who doesn't like a nice bowl of Pasta and pesto? And what better way of adding a little extra something to it than a few leaves of Basil from your very own Basil plant? Everyone does that. But what do we do with the Basil plant later on? Especially when your roommate forgot to water it when you were away? This unfortunate plant has been turned out in Vienna, Austria. 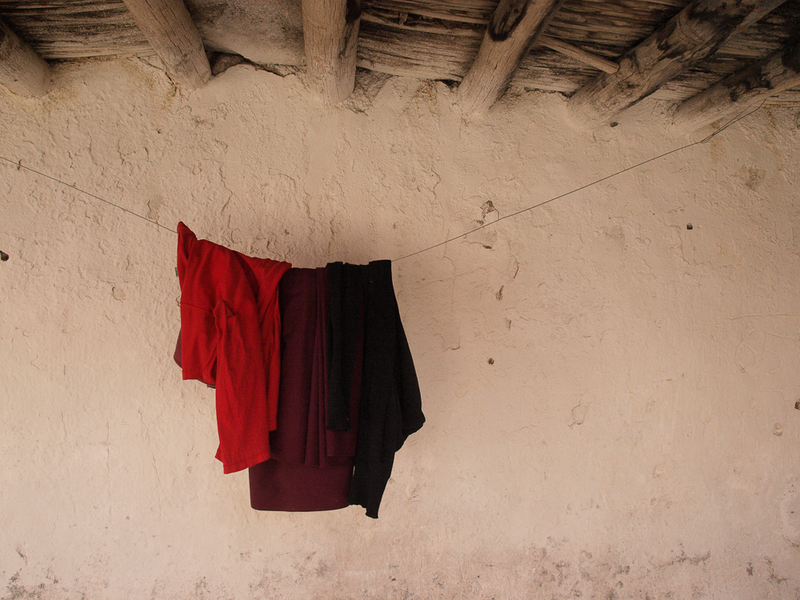 In Shey Monastery, near Leh, Ladakh, India, a monk's robes hang to dry in the desert air.